WASN'T THAT A TIME (1981) took a winsome look at the seemingly last reunion of the legendary folk group The Weavers. 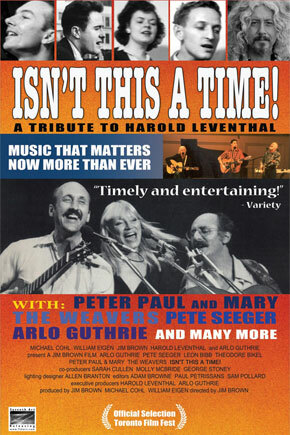 Nearly two decades later, The Weavers are surprisingly back - now well into their 70s and 80's, yet as outspoken as ever at Carnegie Hall, and featuring many of folk music's leading lights, to honor an unsung American hero: music impresario Harold Leventhal. A magical evening: that of a family of artists who were never stymied by hardship, censorship or even generation gaps - to bring an intoxicating, heart-stirring brew of American history, political chronicles and powerful music. 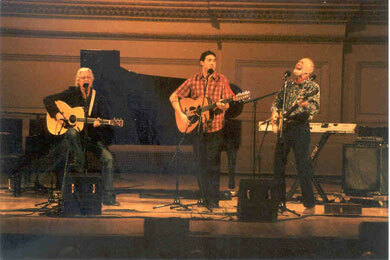 Certainly no one could have foreseen Pete Seeger, Fred Hellerman, Ronnie Gilbert and Erik Darling getting together again in 2003 joined by Peter, Paul and Mary, Theodore Bikel, Leon Bibb, Arlo Guthrie, Sarah Lee Guthrie and Tao Rodriguez-Seeger. Then again, no one could have foreseen the incredible shifts and rifts in American society that have once again sparked The Weavers' irrepressible spirit of speaking out through music. Three time Emmy-award winning producer/director Jim Brown is responsible for some of the most popular and critically acclaimed programs on American music in the last three decades. Brown has produced and directed projects for Columbia Records, Sony Music, Polygram, Island Records and Palm Pictures. He has also done Emmy Award winning work for Sesame Street where he produced segments on cultural diversity for children. Jim Brown is an Associate Professor at New York University's Kanbar Institute of Film and Television at Tisch School of the Arts.